It’s well overdue that the misleading myths on immigration are thrown into the trashcan. The fact is that President Donald Trump’s own government research shows that Mexican migration has dropped sharply in recent years. In Britain, the Brexit debate which began with a whipped up crisis about immigration has now moved to a level where it’s tearing the country apart. In France and Belgium immigrants are falsely blamed for Islamic terrorism. In Sweden and Denmark they push traditionally left of center electorates rightward. 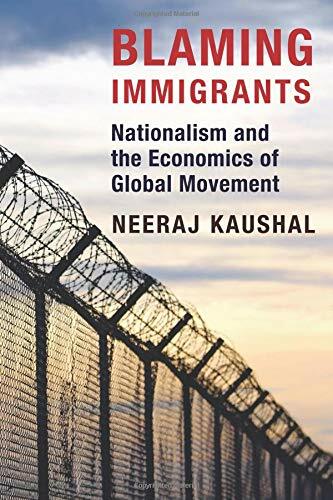 A new book on the subject, Blaming Immigrants, by University of Columbia professor, Neeraj Kaushal, says it all. It pulls together most of the research so far done. Immigration is one of the most divisive issues of our times. Yet the increase in immigration globally is largely in line with the growth in world population. It was 3% in 1990 and in 2015 also 3%. It needn’t be so divisive given good political, religious, and media leadership. In the US the focus is on the wall. There are far fewer reports about positive developments in some cities. In New York, where 36% are foreign born, the city provides ID cards for illegal migrants. There’s free health insurance for the children of illegals. Public universities provide tuition subsidies for illegals—as happens in 22 other states. In Florida, Miami has the world’s highest proportion of foreign-born residents, yet it has had no immigration crisis. Our media don’t highlight the good side of things. How many people are aware that in the last presidential election the counties bordering Mexico and most affected by Mexican immigration voted for Hillary Clinton over Donald Trump? In Austria the inflow of Syrian refugees weakened the political support for the large far-right movement. We need to know why this is so if anti-immigrant forces are to be defeated. Turkey is one of the most hospitable of all countries. A survey carried out at the peak of the Syrian refugee crisis found that 73% of respondents believe that accepting and supporting refugees is a humanitarian mission. Canada welcomes immigrants and refugees, both skilled and unskilled. Three-fourths of Americans believe immigration increases crime. In fact, first generation immigrants are less criminally inclined than local populations, and the crime rate for both locals and immigrants has been decreasing almost everywhere for a decade now. During 1992–2016 the violent crime rate almost halved. Because the last three years refugees have been coming mainly from the Middle East there’s a widespread assumption in the US and Europe that would-be terrorists are hiding among them. But not a single known terrorist has entered the US from the Mexican border. A full 75% of American terrorist incidents have been carried out by locally born whites. In 2015 there were 211 terror attacks in Europe, but 65% were by separatists and 17% by jihadists. The costs of a restrictive immigration policy are high. Low skilled immigrants have contributed significantly to economic growth. They gravitate to growth areas. Immigrants bring demographic dividends. Japan and some East European countries are finding they are seriously short of labor, but they won’t open their doors. (Japan last month announced a partial and limited opening.) Their growth rate is suffering. In Germany it’s expected that by 2050 there will be a 27% fall in its working population. Where will the money come from to look after an ageing population which no longer pays much tax if there’s not an influx of tax-paying immigrants? Immigrants only come to a country if there are large numbers of job vacancies. There’s a grand debate among economists whether immigration hurts the wages of locals, particularly less educated, less skilled, natives. One respected study by George Borjas of Harvard suggests that a 10% increase in immigration lowers the wage of the native worker by 3%. But other economists say Borjas has ignored the steady rise of women entering the work force, which has been a major factor in lowering wages. In fact most immigrants move to cities that have booming economies where their overall contribution is a plus. It’s the sending countries that lose most. It’s their most motivated workers who emigrate. On the other hand their remittances help the balance of trade of their home countries. There’s still much to be done to make immigration more palatable: an end to policies that stress multiculturalism at the expense of integration, which has led to ghettoization, which increases crime and degrades schools, and job retraining for locals so that immigrants don’t leap over the heads of unemployed locals. A wall cannot be built to stop immigration. We have to learn to make the best of it.